Frederick L. Kirschenmann, a longtime national and international leader in sustainable agriculture, shares an appointment as Distinguished Fellow for the Leopold Center for Sustainable Agriculture at Iowa State University and as President of Stone Barns Center for Food and Agriculture in Pocantico Hills, New York. 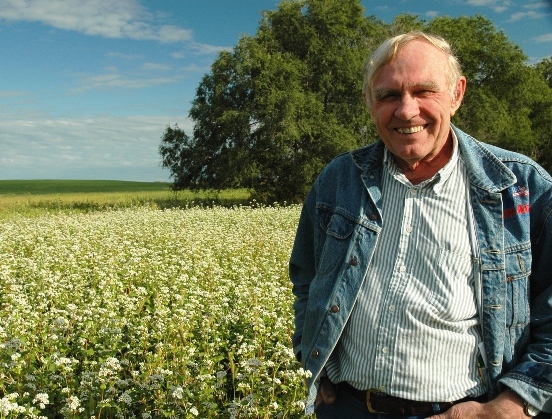 He also continues to manage his family's 1,800-acre certified organic farm in south central North Dakota. He served as the Leopold Center's second director from July 2000 to November 2005, when he was named a Distinguished Fellow. He joined the board of the Stone Barns Center in 2004 and was elected president in 2007. In January 2008, he assumed a half-time appointment at Stone Barns, dividing his time between Iowa and New York, to explore ways that rural and urban communities can work together to develop a more resilient, sustainable agriculture and food system. In this Ted Talk, Dr. Kirschenmann talks briefly about sustainability. When it comes to sustainability in agriculture, you will not find many if any people with more experience and knowledge than Dr. Kirschenmann. In our interview today we talk about sustainable practices and what the farmer/rancher needs to be looking at to be profitable over the course of the next 20 years. We talk about cover crops and a some of the benefits of cover crops for both crop farmers and graziers. You will get a lot of very valuable information from this interview with Dr. Fred Kirschenmann. If you want to learn from Dr. Kirschenmann and all his experience, you need to hear this interview!